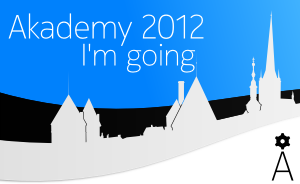 Yes, Akademy 2012, the KDE summit, will take place in Estonia, and thus everyone has a reason to visit Tallinn later this year. Yes, everyone, as one need not be a KDE user to attend (I am not). The program contains sessions that can be of interest to anyone interested in Free Software community management, and the BOFs are bound to provide something for everyone. Furthermore, any FSFE Fellow or an active volunteer is always welcome to contact me personally, and is bound to receive a few hours of my time to discuss Free Software or explore the city of Tallinn. KDE is also looking for volunteers. Furthermore, if someone has first-hand knowledge of places to go out to in Tallinn, feel free to contribute to the wiki. Otherwise I will be forced to rely on review sites to help compile the database. Also, I have couple of ideas for BOFs/workshops I would appreciate input on, but they will have to wait until I will have discussed them with the team. However, I am confident they would be interesting to a wider audience. So, I am looking forward to seeing some of the readers of FSFE planet (en) in Tallinn. And we are going to have fun time, are we not?